The ALTERNATIVE-project was set up in the framework of the Seventh Framework Programme (FP7) Security Call for Projects, launched by the European Commission in July 2010. The project is a medium-scale focused research project linked to the themes ‘Security and Society – Ethics and Justice – Conflict resolution and Mediation’. The idea for the project arose in the light of the awareness of the limitations of research in the field of restorative justice (RJ) and at the same time its potential application in the field of security. The project, by the use of action research methodology, assembles knowledge about RJ interactions starting from a few selected security sensitive areas. We focus on the intercultural context, because of the current relevance of the intercultural context to security matters and threats in Europe. Understanding the significance and impact of cultural difference is especially important for analysts or practitioners of conflict resolution who work in intercultural contexts, since culture affects many of the communicational or interlocutory processes that lie at the heart of most conflict resolution techniques. 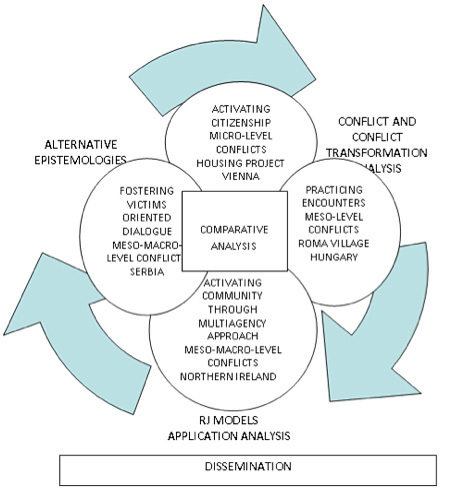 The project studies both the phenomenon of conflict (its nature, characteristics, evolution, definitions, understandings) and conflict intervention in intercultural contexts, as seen from the framework of restorative justice, and provide alternative understandings of both. Meso-level: local community, village, neighbourhood, school, etc. ALTERNATIVE has at its core four intensive case studies (which mainly take the form of action research activities) built around, supported by and mutually feeding into three more theoretically oriented work packages and thus into the project as a whole. A comparative and dissemination work package have been incorporated into the research to make the flow of information and action possible on all directions. These different parts together are to produce a spectrum of theoretically grounded and empirically tested models of dealing with conflicts in intercultural settings by RJ oriented processes. The theoretically oriented work packages deal mainly with alternative epistemologies of justice and security, conflict and conflict resolution approaches, and RJ models application and their relevance for European policies. The action research work packages deal mainly with activating civil society, fostering-victim oriented dialogue, activating community through multi agency approach, and practicing encounters. In each of the action research work packages the assessment of the phenomenon, as it appears in the different research sites, precedes the development of the action research programme. and at the meso/macro-level – civil conflicts at three sites: conflicts between a local community and gangs of youths; between long term residents and recent immigrants; and inter-community sectarian conflict (Northern Ireland). Dissemination has been conceptualized as an ongoing cyclical process of discussing, adapting and further applying the models developed and tested. We will set up an adequate mix of communication media both at the national and at the European levels. The expected results of this project are therefore not static, they will consist of sets of materials to be used in processes that are to become self-sustained. By this holistic perception of intercultural immigration related and other conflicts and by trying out concrete practices to tackle them we hope to arrive at models that can be transferred and adapted to similar problem constellations elsewhere in Europe. This highlights deeply and clearly the alternative approach we would like to take and propose to matters of intercultural conflict and conflict resolution.